stir in taco seasoning and water and simmer for 5 minutes. 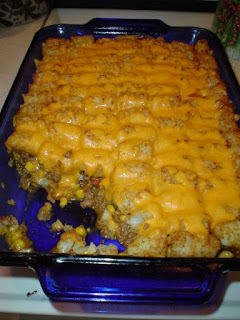 add corn soup put in 9 x 13 pan and top with tater tots. take out top with cheese put back in oven for 5 minutes or till cheese is melted. add ketchup or taco sauce when served tastes very good enjoy.